Oh, you knew I was going to post a take on my Peanut Butter Cookies again. Clever reader. This is hard to type as I slashed my thumb, whilst not paying attention, my own fault, while making BNS Cottage Pies, with turkey, take that traditionalists!, joking, but turkey works well, was cheap and it saves me coming up with a new name for vegetable topped meat in gravy. I hope to have fresh herbs in a few months that will make them even better. Okay onto the second part of this, flourless cookies are a fun way to test out new butters to see how they fare in taste and texture as well as stability. So, how did they fare you ask inquisitive reader, not: “How’s the thumb?” For shame gentle reader, for shame. I have notes here that are for these, the butter, hosepipe cloches and cold-frame improvements. I don’t joke when I called myself a Jack-of-all-trades. Squiggle, squiggle line…who wrote this?! Oh, right, I did. These didn’t require any fiddling with, unlike the Sun Butter version. The dough was slightly crumbly, but when worked together it held just fine. There’s no need to wet or smooth these, they come together quickly like their peanut counterpart. They bake quickly, but sadly don’t achieve the same rise the nut versions do. They don’t crack as much as the sunflower version though. They taste as you’d expect, but I found the little hit of sweetness really helps. The texture is where it’s most interesting. They have a coarse texture, crispy on the outside, with a moist and crumbly centre, though the cookies themselves are quite sturdy and can be eaten warm. They feel like what I imagine oatmeal cookies do, and as I’ve never eaten oatmeal cookies, I know, right?, you’ll have to just try them for yourselves. Not a bad recipe, if I didn’t have trouble with histamine I’d keep eating and making them frequently, as it is I’ll just drop in occasionally and see if I can’t do something new with them. Okay, that’s it for now. See you soon. 2. Put everything into a bowl and mix, with an electric mixer, until a shiny, slightly crumbly dough, that comes together when pressed, has been formed. 3. Form into 1 Tbsp sized balls and flatten onto Greaseproof Paper and bake for 10 minutes until firm to the touch. Then remove from Oven and rest on tray for a further 10 minutes. Then let cool completely on a wire-rack. Happily my first batch of squash seedlings are getting their true leaves. Others are still starting. I’m working from scribbly notes, par the course really. I only made it today, but the finer details have a way of eluding me when it comes time to post the recipe. This is a slightly more involved recipe, nothing too demanding, it’s just you’ll have to taste test the seeds while they roast. No, no! Don’t climb into the oven, over-eager reader, just pop a few in you gob and make sure you aren’t letting them burn. This could be said to be a Toasted Pumpkin Seed Butter, you could just heat them enough to facilitate blending, that’d give you a greener colour, but less roasted seed taste, which I really enjoy. As I say you’ll have to figure out where you stand on the raw to burnt spectrum. I went for well toasted, the seeds were crispy. There was crackling, but no popping, I’m not sure if hulled seeds pop as much as ones fresh from the squash. Grind to powder then add the oil. It becomes second nature with some practice. This taste pretty nice, I opted for a plain version, as you may have guessed this is another two-parter. You could salt it, perhaps use olive oil instead of coconut. You have to remember this is the seed, it will pair differently, taste-wise, from the flesh of the pumpkin. It’d go wonderfully in smoothies or as a quick filling spread. I have to limit my consumption, story of my life, so I just went for enough for one recipe. Which is coming in a moment. See you soon! This little processor has been going for years. No idea how it hasn’t blown up from over working. 1. Pre-heat oven to 200c (Fan) and line a baking tray with greaseproof paper. 2. Spread the Pumpkin Seeds out and then bake for 20-30 minutes until fragrant and brown. Taste Test and stop roasting when desired taste has been achieved. 3. Add the Roasted Seeds to a food processor, while still warm, and blend until a smooth glossy paste has been formed. Add Oil as needed to facilitate blending and stop every few minutes to prevent food processor over-heating. Store it in the fridge. 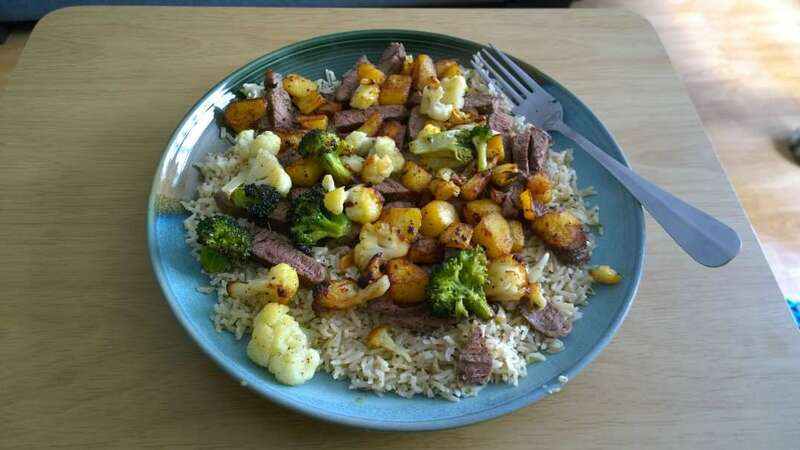 An assortment of vegetables from the garden with steak over rice. 1. Add the Water and Rice to a flat bottomed pot. Put the pan on high heat. Wait till the water boils and starts bubbling then turn the heat down to medium (3 on hob) cover and let it just sit there for 20 minutes. 2. After the 20 minutes is up, turn off the heat. Let it stand for another 10 minutes or so. After 10 minutes, lift the lid and take a fork and fluff the Rice. Pumpkin Seed Butter Rice: Add 1 Tbsp Pumpkin Seed Butter alongside Water and Rice, stir while boiling until dissolved. When boiling turn down and cook as normal. Tahini Rice: Add 1 Tbsp Tahini alongside Water and Rice, stir while boiling until dissolved. When boiling turn down and cook as normal. Turmeric Rice: Add 1/2 Tsp Ground Turmeric or 1 and 1/2 Tsp Fresh Turmeric alongside every 1/2 Cup of Rice. Nut Butter Rice: Add 15g of any Natural Nut Butter and Pinch Salt to Water and Boil until dissolved. Add Rice and cook as normal. Sweet Potato Rice: Add 50g Finely Cubed Sweet Potato alongside Rice and cook as normal. Raw Garlic Rice: Add 2-3 Garlic Cloves, grated, and 1 Tbsp Butter/Olive Oil just before serving. Rice and Quinoa: Add 25g Washed Quinoa alongside Rice and cook as normal.